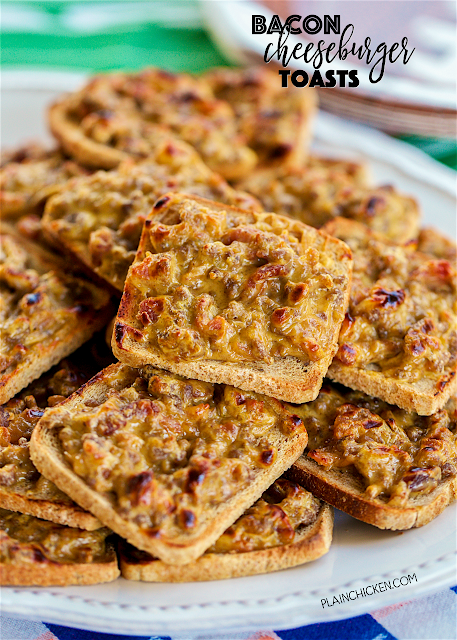 Bacon Cheeseburger Toasts - SO good!!! We love these for parties and a quick lunch or dinner. Only 5 ingredients and ready in minutes! Hamburger, bacon, worcestershire sauce and Velveeta cheese on top of party rye bread. YUM! Can make ahead and freeze for later. I always have a batch in the freezer. SO quick, easy and delicious!!! EVERYONE LOVES these!!! TGIF!!! We are one week away from the Super Bowl!!! It should be a great game! I am already working on our menu. We usually stay home and eat party food for the game. 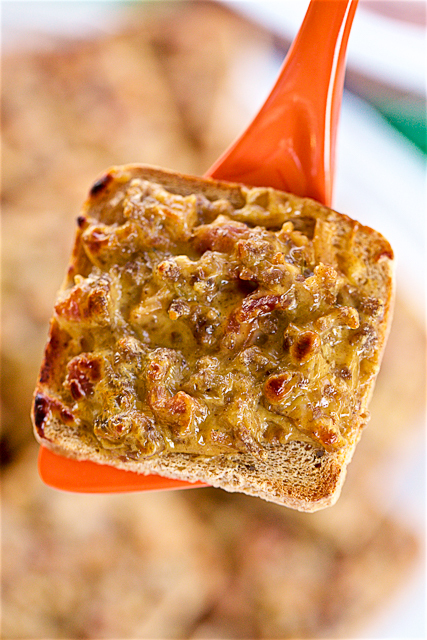 I do know one thing that is definitely going on the menu, these Bacon Cheeseburger Toasts. OMG! They are SO good!!!! Hamburger, bacon, Worcestershire, Velveeta on top of rye bread. We LOVE these things. Great for parties and a light lunch or dinner. I make these all the time and freeze them for later. I assemble them and put them on a baking pan in the freezer. Once they are frozen, I put them in a freezer bag. I pull them out when we are ready to eat them and cook them. I already have my batch in the freezer ready to go for the Super Bowl! In a large skillet, cook ground beef until no longer pink. Drain fat. Transfer to microwave-safe bowl and add bacon bits, and Worcestershire sauce. Cut Velveeta into small pieces and add to bowl. Microwave for 30 seconds and then stir to combine. Cook in 30 second intervals just until mixture is combined. Turn broiler on HIGH and broil toasts for for 3-5 minutes in the oven and serve. If you freeze them, allow to thaw before broiling in the oven. My Mom made these when I was growing up - she called them "Party Pizzas". Her recipe was 1 lb breakfast sausage, 1 lb hamburger, 1 lb Velveeta (with some spices - worchestershire sauce, garlic powder, onion powder and a dash of Italian seasoning). I still make them and spread on full size Rye bread (easy to freeze and pull out for meals). YUM!!!! !